MacDougall’s Russian Art Auction, a key event in London's Russian art week featuring the most important Russian works of Art, Icons, and Fabergé on the market brought in USD 17,166,183 today. The highest fetching lot of the day was Pavel Kuznetsov’s Eastern City, Bukhara sold for USD 2,367,600. The masterpiece represents the culmination of Kuznetsov’s efforts to combine new avant-garde principles of fragmented forms with influences of the ancient tradition of icon painting and Central Asian folk art and is the most important painting from his celebrated Central Asian series of 1912–1915. Robert Falk’s double-sided composition Boy with a Cap Sitting on a Chair, anticipated to be one of the sensations of London’s June Russian sales, sold for USD 1,728,450, within it’s estimate of USD 1,300,000 – 2,000,000. It dates from the time of the first exhibition of the Jack of Diamonds group, a period from which very few works remain in private hands. The exceptional work was painted in the Bashkir settlement of Maksyutovo to which Falk took his first wife to be treated for consumption with mare’s milk in 1910/11. 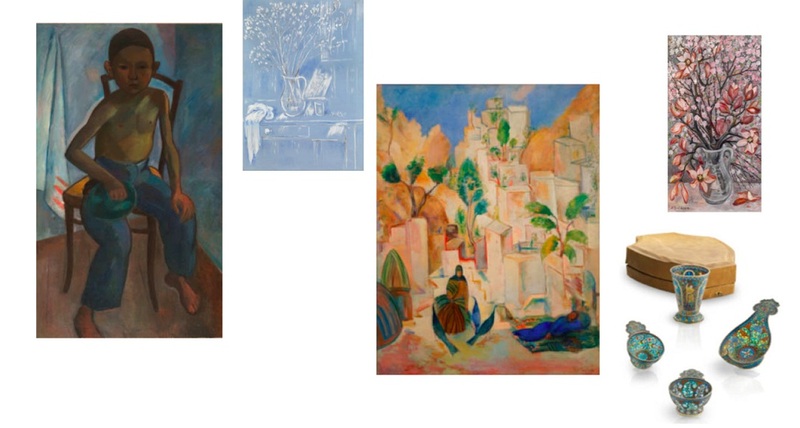 The artistic couple Mikhail Larionov and Natalia Goncharova were particularly well represented with four lots among them, although celebrated they proved to be weak on the market. Larionov’s poetic tempera, Still Life with Flowers which he painted in Paris in the 1920s sold for USD 921,777. Natalia Goncharova’s Still Life with Magnolias of the same vase and scene went unsold along with two of Larionov’s impressionistic paintings. Amongst the icons to be offered were some unusual examples showing the development of Russian iconography from the 17th century to the revolution of 1917. The top lot was the masterfully executed “Cloud” Dormition, exquisitely detailed and a fine example of Palekh painting, bringing in USD 99,866. A masterpiece of silver and enamel craftsmanship by the workshop of Pavel Ovchinnikov was also sold, a beautiful rare presentation pique-à-jour set won by a lucky bidder for USD 21,710. For three consecutive years MacDougall’s Russian sales have totaled over USD 33,5 million yearly, today’s sale shows indicates potential record-breaking progress. See more Russian Art on Barnebys here. See MacDougall’s auction offerings here.